Hurtigruten ships are amongst the most important means of transportation along Norway’s twisting, rugged coastline for locals and visitors alike. The service is often called “The World’s Most Beautiful Voyage”. Ports called to by day on the way north are visited at night on the way south. 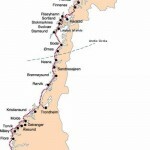 For a larger map of the Hurtigruten coastal voyage itinerary click the button below. This is also the itinerary for the 6 night Classic Voyage North. Depart from Bergen at 8.00pm. Explore your ship and get to meet your fellow passengers as you take in the spectacular landscapes. An early arrival at the Art Nouveau town of Ålesund affords an opportunity to go ashore and explore this pretty town. Optional excursions include a guided walking tour of the town. Departures between 14 April and 14 September will sail into the UNESCO World Heritage Site of Geirangerfjord. Continuing north, we head for the medieval city of Trondheim, whose colourful history is reflected in its handsome civic architecture. Optional excursions include the mediaeval Nidaros Cathedral or the enthralling Ringve Music Museum. Crossing the Arctic Circle, continue to the modern town of Bodø. Optional excursions include the Saltstraumen – Sea Eagle Safari where you witness the world’s strongest tidal current, while overhead there’s a good chance of seeing Europe’s largest predatory bird, the sea eagle. Day’s end sees you amidst the glorious Lofoten Islands and their stylish capital, Svolvaer. Between late May and late July experience the magical light of the Midnight Sun. A relaxing morning at sea precedes your arrival in Tromsø, the capital of the Arctic and starting point for many polar expeditions. Optional excursions include a Polar History Walk to include the fascinating Polar Museum, an Arctic Capital bus tour taking in the modern Arctic Cathedral, whose eastern wall is a fabulous stained glass window. In winter try an exhilarating excursion by husky dog sleigh through the stunning scenery. Following an early call at Hammerfest you arrive in Honningsvåg, the gateway to Europe’s most northerly point, the North Cape. Optional excursions include a bird watching safari, a North Cape tour and a unique opportunity to meet a family of Sami reindeer herders who will offer you an insight into the rich history of the Finnmark area. In winter, options also include a snowmobile safari(driving licence required). The vistas and seal life become more dramatic as you approach Kirkenes, just a few kilometres from the Russian border. This is the town where the northbound only passengers disembark for their flight home and where the 5 night Classic Voyage South passengers join the ship. Optional excursions include a River Boat or Quad Bike Safari to the Russian border and during the winter months a visit to the Snow Hotel. This is also the itinerary for the 5 night Classic Voyage South. As the ship heads south, the ports visited by night on the way north are now seen by day. Hammerfest, the world’s most northerly town, is the first major stop before continuing to Tromsø. Optional excursions include Breakfast at the North Cape, followed by a memorable drive through the dramatic Arctic landscape to rejoin the ship in Hammerfest. During the summer enjoy the Midnight Concert in the Arctic Cathedral in Tromso. A highlight of the southbound journey is this daylight sailing through the Lofoten Islands, for many the most beautiful part of the Norwegian coast. The ship negotiates a stunning network of inlets and isles, including a possible detour into the spectacular and dramatic Trollfjord. Optional excursions on offer include an overland trip across Lofoten from Harstad, rejoining the ship in Sortland, and a Sea Eagle Safari. Crossing the Arctic Circle and sailing past the famed peaks of the Seven Sisters, this part of the journey allows you to fully appreciate the changing coastline. Before arriving in Rørvik, why not join the optional excursion to visit the Vega Islands, added to the list of UNESCO World Heritage Sites in 2004. An early arrival in the medieval city of Trondheim offers a chance to explore and maybe visit the Nidaros Cathedral. Discovery Voyage (10 nights) passengers disembark here and have the full day to explore the city and stay one night before catching their flight home. Round Trip passengers stay with their ship which continues out of the Trondheimsfjord and past Hitra Island, making brief calls at Kristiansund and Molde before a midnight call at Alesund. 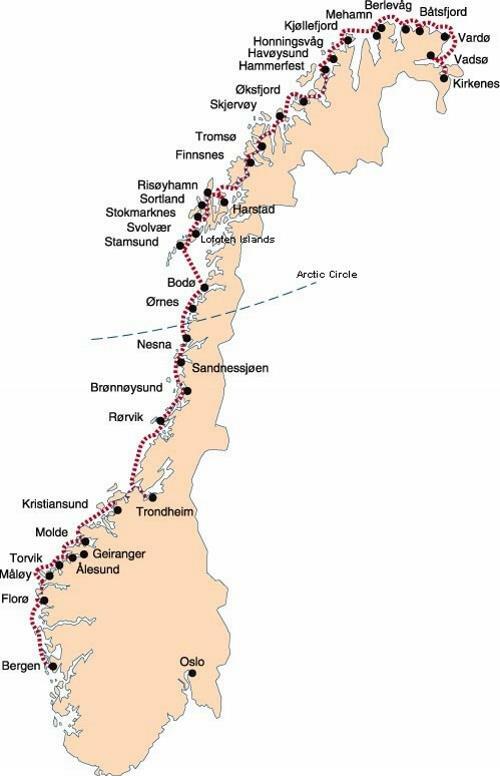 The option exists to take an overland excursion along the Atlantic Road from Kristiansund to Molde. Along the way you’ll visit a traditional stave church and pass through picturesque landscapes, before re-joining the ship. Arrival in Bergen at 2pm sees the end of this magnificent journey.